After two months with the organization, Calgary Flames president of hockey operations Brian Burke pulled the proverbial rip-cord last week, firing general manager Jay Feaster and assistant GM John Weisbrod. Temporarily at the helm of the Flames ship, Burke will undoubtedly try to get a permanent replacement for Feaster in place before too long. The big question is who that person will be. In four of the five previous GM transitions, the replacement came from within the Flames organization, with an assistant usually taking over the big chair when their boss got turfed. But with assistant to the general manager Craig Conroy just in his third season as an executive, it’s unlikely he’ll be considered for the general manager vacancy. Based on Burke’s latest round of interviews and media appearances, we have a few guidelines to estimate who will be considered contenders for the position. They have to buy into Burke’s “black and blue hockey” blueprint. They should have a background in drafting and/or player development. They should have either previous experience working with Burke, or a willingness to be mentored by him as they grow into the job. Burke himself noted that he’s considering guys that are either younger executives with experience or a “young star” that hasn’t gotten a chance at the big chair yet. Here are 10 names to consider as possible fits in Calgary. Currently the assistant general manager for the Boston Bruins. Extensive scouting background with Anaheim and Buffalo prior to joining Boston. No previous experience alongside Burke, but he’s undoubtedly familiar with him based on many past Toronto/Boston battles. Currently the assistant general manager for the Nashville Predators. 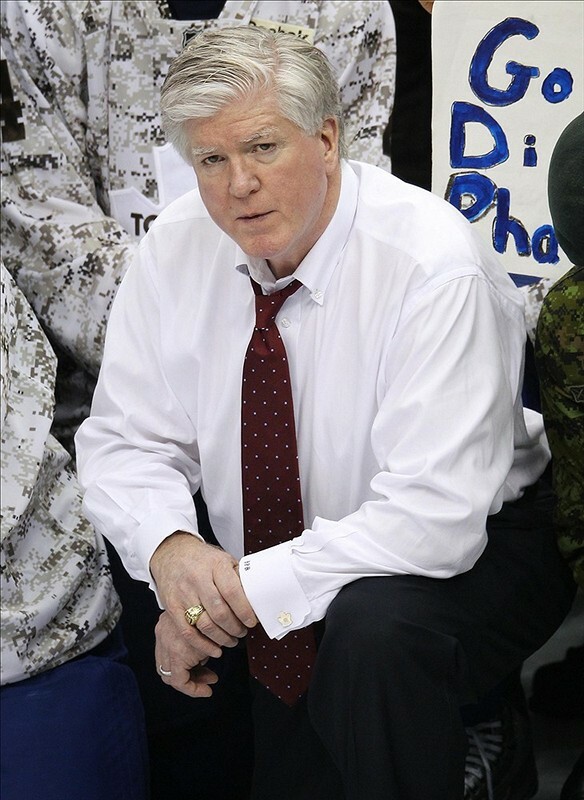 Previously worked as a pro scout with Anaheim and as the director of player personnel for the Predators. Has been the protege of David Poile in Nashville. While Poile’s not going anywhere anytime soon, he and Brian Burke are familiar with each other due to their mutual involvement with USA Hockey. Currently the co-director of amateur scouting for the Los Angeles Kings. Previously a coach with the Toronto-St. Michael’s Majors of the OHL and the general manager of the Owen Sound Attack. Outside of Boston, probably the team that screams “black and blue hockey” the most are the Los Angeles Kings. Along with Mark Yannetti, Futa’s been one of the architects behind the Kings transformation over the past few years. Currently the director of player personnel with the Ottawa Senators. Previously a scout with the Montreal Canadiens and New York Rangers. The Senators have been the beneficiary of some strong drafting over the past few years and Dorion is one of the guys that has been behind those efforts. He’s young as far as execs go (he’s in his early 40s), but he’s from the Ottawa area and may not want to leave home. Currently the director of scouting for the Florida Panthers. Previously a scout with the Ottawa Senators and Tampa Bay Lightning, and the director of amateur scouting with the Panthers. Despite their recent struggles, the Panthers have had some strong drafts in the past few years. Luce has been the head of Florida’s scouting for the past several drafts and can take some of the credit. He’d be a good fit for a club looking to re-load in the draft. Currently assistant general manager for the St. Louis Blues. Previously a scout for the New York Rangers and director of pro scouting for the Blues. One of the biggest recent success stories, in terms of a team rapidly improving, has been the St. Louis Blues. While Doug Armstrong has been in the big chair for the big strides, McDonald has been close-by and getting a great deal of experience in the process. Like Fenton in Nashville, it’s not likely McDonald gets promoted in St. Louis. Heading to Calgary may be the best shot he has at a GM’s job. Currently vice-president of hockey operations for the Toronto Maple Leafs. Previously head coach at the University of Notre Dame and a scout for the Anaheim Ducks. Poulin has a strong, well-rounded resume. He’s a hockey guy who’s scouted, he’s coached, and he’s got front-office experience in Toronto. And heck, his experience in Toronto was alongside Brian Burke. Toronto’s also gotten quite a bit better with him in town, so his track record is on his side, too. Chicago director of amateur scouting Mark Kelley, Philadelphia assistant general manager Bryan Hextall, Phoenix assistant general manager Brad Treliving, Pittsburgh assistant general manager Jason Botterill, and Vancouver assistant general manager Laurence Gilman.